I posted the pic, as seen here, on Instagram, and one friend asked me for the recipe, and another friend had it at my house and was surprised that there was no dairy cheese involved, so here’s my approximation. I’ve become that person that makes cashew cheez by “feel” instead of by recipe, and I think it tastes best when you do it to your own specifications. Set oven to 350°F and gather your tools and ingredients. Tools recommended: immersion blender, plastic cup for blending cheez with the immersion blender, ceramic/glass serving/baking dish. Quick soak the cashews. Bring about 2 cups of water to a boil, and simmer the cashews for 30 minutes, drain the water and set aside. Make the pasta according to recipe, making sure it’s al dente. Drain the water and put in a baking dish. Put the cashews in a immersion blender-friendly cup that holds around 2 cups, or put cashews in a blender. Add enough vegetable stock to just cover the cashews and keep handy in case you need to add more. Add the nutritional yeast, and start blending. Watching how the consistency changes while blending, add just enough vegetable stock for it to be a good cheese sauce consistency. Blend until smooth. Taste the mixture and add salt, pepper, and/or nutritional yeast to bump up the flavor. For a spicy kick, consider adding a tablespoon of smashed chilis in adobo. In a little dish melt the vegan butter and add the panko, salt and pepper to taste, stir together until well incorporated and set aside. Gently fold the cheez mixture in with the cooked pasta, then sprinkle evenly with the panko mix. Bake for 15-20 minutes, until the topping has a nice toasted brown look. I hope you enjoy this recipe! This is an approximation of what I make, so let me know if you make it, how it turns out! Interior of a coffee house stuck in time. It’s my “night out” and I felt the need to post that I’m at a coffee shop that is stuck in a bit of a time warp, but that’s so much more prefarable than the first place I went, which was hosting an MLM jewelry event with a bunch of people who feel like an itchy, ill-fitting sweater. Can’t speak to the coffee, but the cider, beer, and wine selection is quite decent. August 27, 2018 April 2, 2019 Jane E.
Today I managed to whip up my best version of vegan buttermilk biscuits. They ended up tiny because my biscuit cutter is tiny. I used a basic buttermilk biscuit recipe, but substituted coconut milk and lime juice for buttermilk, and my new favorite thing, Miyoko’s Vegan Butter. This stuff is amazing, and I’m looking forward to trying it in more baked goods. It’s also great on popcorn and slathered on toast. 1 – Mix the lime juice and the coconut milk together and set aside. 2 – Cut the Vegan Butter into the the flour using a fork and knife or a pastry cutter, so it is a crumbly texture, with pieces only as big as peas. 3 – Add the milk mixture to the flour mixture, stirring with a spoon and only until all of the flour is just moistened and pulling away from the outside of the bowl. Enjoy with more vegan butter, and maybe some jam! A million years ago I found Isa Chandra Moskowitz‘s Post Punk Kitchen, and on it, I found her recipe for Chai Spiced Snickerdoodles. Of course, today I had a hankering for it and found that she had moved her site, and some of the recipes were no longer available. But! Thanks to archive.org, I was able to find the recipe. I thought I’d share this joy with you. They were delicious. January 23, 2018 Jane E.
Last night I made a Red Waldorf (aka Red Velvet) cake with cream cheese frosting. Hidden inside were balls of pink and purple cake-pop dots, that could have been skipped, but were fun to try. I used the Better Homes and Garden’s cake recipe (found here), but skipped their frosting, opting for a cream cheese frosting recipe found here, thinning it out a touch with a splash of milk. (I opted to go with the BHG cake recipe instead of the one on that page.) I used Nordic Ware Cake Pops Baking Pan to make the dots inside (not seen in my photo, sorry!) and this page, that I found originally through Pinterest, for inspiration. 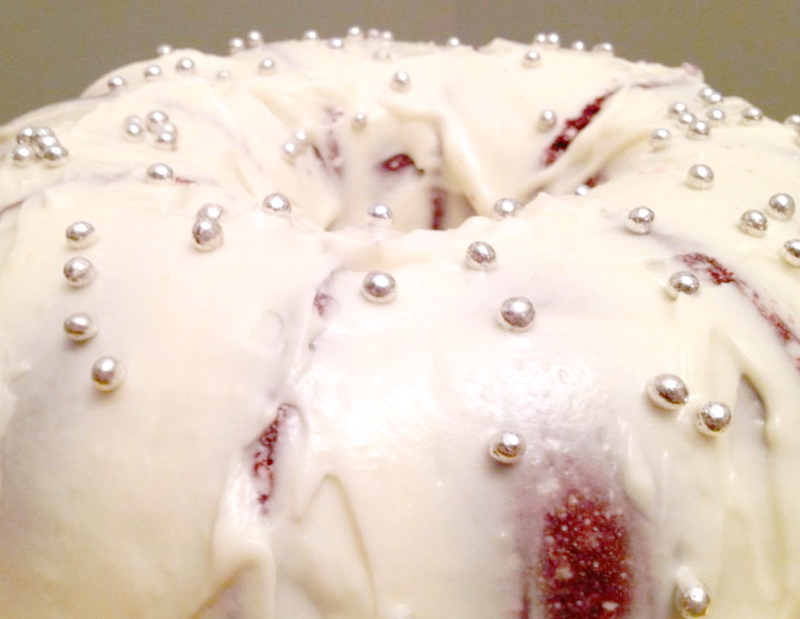 The dots inside didn’t work as well, because I baked the cake in a bundt pan . It just wasn’t surprising enough. A note for the bundt pan recipe – I dropped the temp in the oven to 325°F to bake, and baked for 40-50 minutes, checking with a skewer to make sure it was cooked through. Whether partnered or single, I wish you a Happy Valentine’s Day. Treat yourself to something delicious today! I would like to state for the record that I have never made brioche (though I have made Pulla). I have never laminated anything, let alone dough, nor have I made Tatin style apples. I have made cinnamon rolls, though, so, how hard could it be? Sit back, and ready yourself for two days worth of work, and a lot of research. That’s what this took me. I’m not going to give you the recipe, as that this is one of those triumphs that was cobbled from so many sources, and my own brain, that I couldn’t hope to write them all down. I will, however, point you to my resources. 1. Brioche – this part is easy, as that there is a wonderful source available, and that is the invaluable book Artisan Bread in Five Minutes a Day: The Discovery That Revolutionizes Home Baking . The brioche recipe I used came straight from this book. Other parts I used for guidance were the recipes for cinnamon rolls and such that can be made with enriched breads. This was the most carefree part of the entire endeavor, and this book is a must for anyone who likes fresh bread, but thinks it takes too long to make. I used half the recipe to make one King Cake. 2. LAMINATE. LAMINATE. LAMINATE. – What is laminated brioche? Think like croissants, but breadier. THe happy, buttery layers of bread come by means of laminating! What does this mean? You take a mixture of butter and flour and make it into a sheet, chill it, and then fold dough around it, kind of like the picture in an old ID badge, where the paper is the butter, and the dough is the plastic. I used a few resources to figure out how to do this, but the main one I used was here. Trust me, this is a part where the more research you do, the better. 3.Tatin apples? WTF? – First, thanks Mark Bittman, and How to Cook Everything . The iPhone/iPad How to Cook Everything app found the recipe for sautéed apples, which is what Bittman suggests for a crust-free tatin flavor. Basically, it’s like apple sauce made with extra sugar, and butter instead of apple cider/juice. Thanks to Bittman, something that could have been hard, was easy. I used one recipe of this, and pureed it. 4. Making the crown, and making it pretty – If I had to do it over again, I would have rolled out the length of my dough as a long rectangle on a Silpat first and then placed it in something like this Thunder Group 18 Inch x 26 Inch Full Size Aluminum Sheet Pan . I spread the puree in one layer from edge to edge, sprinkled on the raisins, and would have, had I not forgotten, added cinnamon/sugar sprinkle on top of the apple puree. Finally I rolled it up so it was a long cylinder, much like you would for cinnamon rolls. Before putting the ends together, I recommend cutting the ends off of the cylinder first, then joining them together to make the crown. Finally, I used Google to get the inspiration for making it pretty. I baked the bread for around 35-40 minutes at 325°F on convection. If you don’t have a convection oven, you might want to try 350°F, and rotating the pan midway to get it evenly brown. I hid the baby Jesus in the cake AFTER baking, by stuffing it in one of the folds. The cake came out looking buttery and delicious. I let it cool, and finished it off with a simple milk, vanilla extract, and powdered sugar icing drizzled over it, and an abundance of traditional colored sprinkles in purple, yellow and green. I will be trying this again next year, without a doubt. Though I haven’t tasted this year’s cake (it went straight to my husband’s work), I heard it was delicious. I found this cardamom ice cream recipe yesterday, longing to use some cardamom in something sweet and delicious. Since my family is lactose intolerant, I usually search for vegan dessert recipes. It was easy to adapt this one, though completely experimental. I used my KitchenAid Artisan Series 5-Quart Mixer and the Ice Cream Maker Attachment . Having the ice cream maker attachment in my freezer means that instead of buying ice cream, I can make my own. Also, the effort to reward is HUGE, and keeps me from having a steady supply of superfluous calories at hand. Speaking of calories, I may use less sugar next time, and cut the sugar down to 1/4 or 1/3 cup. In a saucepan, combine the crushed cardamom pods and slit vanilla bean with the milks, and heat until boiling, stirring occasionally, and then let sit off of the heat for 20 minutes. Strain the pods and the vanilla bean from the milk. Scrape the vanilla specks out of the vanilla bean and into the milk, and add the sugar, kosher salt, and ground cardamom. Let cool for at least 30 minutes in the fridge. Use the instructions for your ice cream maker for the rest. Enjoy, and let me know if you try it!